Bullfrog Home Spa Dealer Maple Shade: Why Bullfrog Home Spas? Hot tubs have retained an incredible, timeless quality to them. For years and years, people have enjoyed a nice soak in a hot tub to decompress from a stressful day at work, to recover from an athletic injury, or just for some good ol’ rest and relaxation with friends. You’ll find hot tubs alongside most hotel pools, at ski resorts, spas, and of course, people’s backyards. Some people even have fancy spas custom-installed inside of their master bathrooms! Our point is, soaking in hot tubs has always been a popular, enjoyable, and beneficial activity among the masses. Even our ancestors enjoyed carefully dipping their bodies into natural hot springs, arguably a primitive form of soaking it up in a hot tub or home spa. Yet, as long as humans have enjoyed hot water, hot tubs and home spas have also advanced greatly in recent years. No longer are hot tubs using 80s technology to propel their jets; rather, industry leaders like Bullfrog have adopted a modernized and customized approach to the home spa experience. In other words, things just keep getting better and better for our fellow home spa lovers. Lately, Spa Hearth & Home has been highlighting the fact that we’re a Bullfrog home spa dealer in New Jersey. As we’ve begun carrying these high-quality home spas, we’re excited to share the benefits of owning such a wonderful machine at your home or even your business. We’ve been targeting stress as one of the main things that relaxing in a hot tub addresses, in addition to alleviating muscular pain and even bonding with family members. The truth is, having a hot tub presents a variety of benefits. However, what makes a hot tub from Bullfrog so special? That’s what we’re going to take a look at in today’s blog post. Should you have any questions about your next home improvement investment from our Bullfrog hot tub dealers in Maple Shade, we’d love to help you out! Contact the team at Spa Hearth & Home at any time with questions. Let’s get started. There’s no doubt that sitting in warm water feels great, but it’s the jets that provide a lot of the tension soothing, muscle-loosening benefits that hot tubs are renowned for. As Bullfrog themselves say about their very own JetPak Therapy System, it’s “hydrotherapy so advanced it sets a new standard in hot tub performance.” With personalization in mind, their engineers wanted to design a system that gives users maximum control. If you can think of it, Bullfrog probably makes a jet system that’s perfect for you. With countless interchangeable options, they offer jets for stress relief, relaxation, soothing aches and pains, lower back therapy, neck tension relief, rhythmic massages, and so much more! 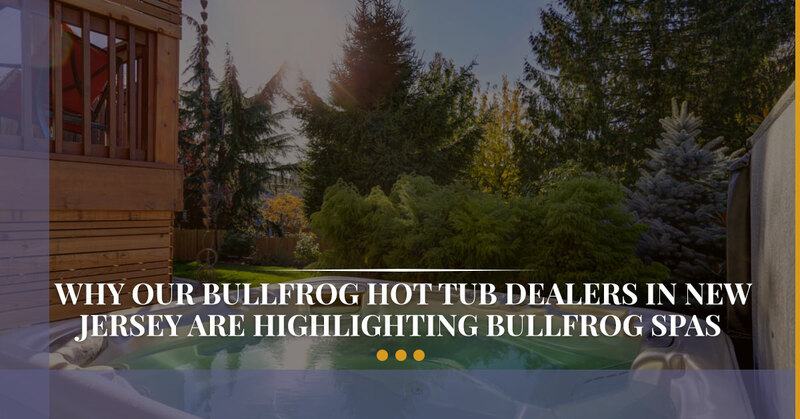 In a follow-up post, our Maple Shade Bullfrog home spa dealers will touch on more reasons why going with a Bullfrog home spa is a great decision. Again, feel free to contact us with any questions in the meantime!